“WOW!” is usually the reaction we get when people visit our store for the first time. Sometimes it’s just a facial expression that says it all for them, mouth agape, but the reactions are always positive. People tell us how many other dealerships they’ve visited and that Bob’s is in an entirely different class. 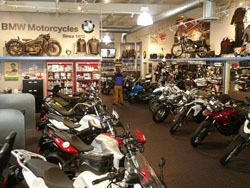 Well thanks to all those requests we are finally doing just that; in essence visually sharing just how amazing the Bob’s BMW brick and mortar store plus the Vintage Museum really is with all those that have only known us for the great service on the phone, at rallies or via our ever changing website. We hope you enjoy our humble photo tour, will share it with your friends, regardless of what they ride and will check back frequently as we promise to add or change the images regularly. And please keep in mind that these images really can’t equal the effect you get by visiting our big, beautiful BMW dealership filled with everything you can imagine that’s connected to the fun, the sport, the thrill, the art, and the heritage of BMW motorcycling – ALL motorcycling for that matter. Despite what you see here that hopefully makes you smile and want to visit Bob’s we change the displays and floor plan regularly to keep it fresh, fun and inviting. It’s intended as a taste and there’s only one way to get the real thing. You’ve just got to come and see it for yourself! So please make plans to visit Bob’s one day even if it involves thousands of miles of travel. Our numerous guest books can attest to the fact that people and other dealers from all over this continent and many others have done just that over the years. The coffee is always fresh and hot; the hospitality unbeatable. And as a further incentive, there are countless other places of interest nearby in the Baltimore-Washington, DC region as well. We are here Monday through Saturday every week of the year, closing for just a few special holidays and on Sunday’s so we too can have a full day to enjoy the BMW motorcycles we love, just like you. Below are a few images and a Video taken throughout the dealership. To see more, you can also visit our Facebook…click here.